(Arabic: الصّفا‎, translit. 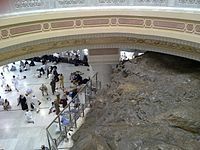 Aṣ-Ṣafā) and (Arabic: ال‎) are two small hills now located in the Great Mosque of Mecca in Saudi Arabia named the Masjid Al-Haram. 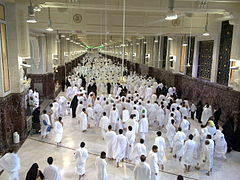 Muslims travel back and forth between them seven times, during the ritual pilgrimages of Hajj and Umrah. 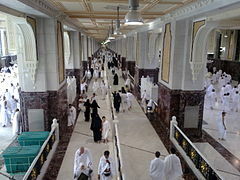 were mound in Central Mecca, surrounded by the homes of the people of Mecca, including Dar al-Arqam. The practice began with Prophet Ibrahims wife Hajar when she was in the desert with her baby son Ishaaq. Alone, with no others to aid except Allah. She needed water and ran between the mountains back and fourth 7 times in search for help. Hence, the ritual during Hajj and umrah. The Great Mosque houses the Ka'bah, the focal point of prayer for all Muslims. 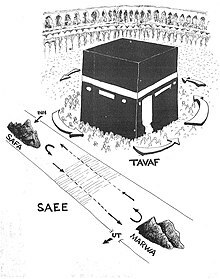 Safa—from which the ritual walking or Sa'i begins—and Marwa are located approximately 100 m (330 ft) and 350 m (1,150 ft) from the Ka'bah respectively. 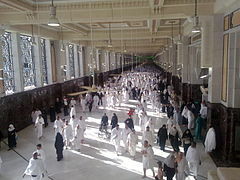 The distance between Safa and Marwa is approximately 450 m (1,480 ft), so that seven trips back and forth amount to roughly 3.2 km (2.0 mi). The two points and the path between them are now inside a long gallery that forms part of the mosque.The two hills are still in Mecca and remind pilgrims of the story of Hagar( wife of Abraham) who ran up and down these hills in search for water / help whilst baby Ismaeel lay thirsty on the desert floor. At this moment miraculously the zamzam water sprung out by the feet of baby Ismaeel much to the relief of his mother. Later both mother and son were discovered by a travelling bedouin community who were amazed to find water in this location as well as a mother and child. Realizing this discovery of water to be a miracle they decided to settle by the water and alongside Hagar and Ismaeel became early settlers of Makkah. In Islamic tradition, Abraham (Ibrahim) was commanded by God to leave his wife Hagar (Hajar) and their infant son, Ishmael (Isma'il), alone in the desert between Safa and Marwa. When their provisions were exhausted, Hagar went in search of help or water. To make her search easier and faster, she went alone, leaving the infant on the ground. She first climbed the nearest hill, Safa, to look over the surrounding area. When she saw nothing, she then went to the other hill, Marwah, to look around. While Hagar was on either hillside, she was able to see Ishmael and know he was safe. However, when she was in the valley between the hills she was unable to see her son, and would thus run whilst in the valley and walk at a normal pace when on the hillsides. Hagar traveled back and forth between the hills seven times in the scorching heat before returning to her son. When she arrived, she heard a voice. It turns out that Gabriel is at the position of the water. She looked for water by his wing until the water appeared, she took a drink of water in her sheds, and drank and breastfed her son. That position was known as the Zamzam Well. Performing the Sa'i (Arabic: سعي‎, translit. Sa‘ī, lit. 'seeking, search,' or 'ritual walking') serves to commemorate Hagar's search for water for her son and God's mercy in answering prayers. The walkway is entirely covered by a gallery and is divided into four one-way lanes, of which the inner two are reserved for the elderly and disabled. Wikimedia Commons has media related to Sa'yee. ^ Mohamed, Mamdouh N. (1996). Hajj to Umrah: From A to Z. Amana Publications. ISBN 0-915957-54-X. This page was last edited on 19 April 2019, at 03:16 (UTC).